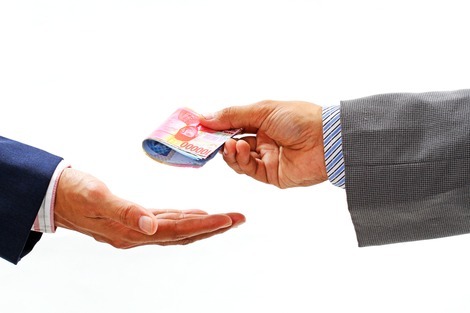 Australia tied with Denmark, Finland and Japan for the title of the world's least bribe-ridden country in 2013. According to Transparency International's Global Corruption Barometer, only 1 per cent of Australians surveyed admitted paying bribes for services. Our cultural resistance to corruption has long been a major contributor to Australia's reputation as a good global citizen. From time to time there are well publicised cases of corruption within Australia, but they are the exception rather than the rule. However a few years ago we had the AWB oil-for-wheat scandal, and now there are allegations of corruption in the international dealings of the large Australian construction company Leighton Holdings and the Reserve Bank subsidiary Securency. The Reserve Bank scandal has been described by Dr David Chalkin of Sydney University as the 'worst corruption scandal in our history, not because of the amount of money that's been involved, but because the most respected institutions of our country have failed to discharge their responsibilities to the public'. It's argued that it is impossible to do business in some countries without engaging in bribery and corruption, often at the highest levels of government. As a Sydney Morning Herald letter writer put it, if you insist that Australian companies are 'squeaky clean' in their international dealings, 'be prepared to see your superannuation funds shrink rather than grow'. The reasoning is that our companies can only expand overseas and grow their dividends by 'adhering to the local standards of business behaviour', however corrupt they may be according to our standards. It is true that turning a blind eye to what we perceive as corruption may bring us a greater financial dividend in the short term. But in the medium and long term, it will make us poorer. Corruption and bribery increase poverty in poor countries that have the potential to be among the world's most prosperous. These include Iraq and Indonesia, where Leighton is alleged to have bribed officials. It is no coincidence that the least corrupt countries — Australia, Denmark, Finland and Japan — are among the wealthiest, while some of the most corrupt — such as Zimbabwe, Paraguay and Liberia — are on the list of the poorest. This argument will appeal to you if you agree with British prime minister David Cameron, who this week talked up the profit motive. But being 'squeaky clean' is not just good business practice. It's also an admirable quality to have attached to Australia's brand and the Australian character, so that if we believe in ourselves, we believe in transparency. Spot on, Michael. The only way to retain a good brand is to be 'squeaky-clean' always. Vide the ALP and the Catholic Church, both of whom would have been better served by a zero-tolerance approach to inappropriate (and what should have been unacceptable) behaviour. Perhaps it is not so. Does the Leighton bribery investigation or use of taxpayers cash by politicians to attend weddings of mates/supporters, or the issues surrounding develoment applications for coal mines affect the ratings? Yes, I think it does Laurie. At the recent election, about one third of all voters voted for someone other than the major parties. That, I think, reflects a fairly widespread disgust with the values and morals of many main-stream politicians of both ilks. Snouts in the public trough are not all that far removed from hands in the public till. Out of little things big things grow. Our Prime Minister is making it all too clear that corruption starts with an unwarranted sense of entitlement. Unfortunately when it comes to corruption George Bernard Shaw's advice is not much help: I learned long ago, never to wrestle with a pig. You get dirty, and besides, the pig likes it. The last sentence, the quote from Pope Francis, is missing four words when compared to the piece in The Economist it is linked to in the penultimate sentence. The restored quote makes a little more sense, and is perhaps more thought-provoking: "Everyone has his own idea of good and evil and must choose to FOLLOW THE GOOD AND fight evil as he conceives them. That would be enough to make the world a better place." Some miners must be wondering whether they took the right course in opposing the Rudd Government's Resources Super Profits Tax, in which taxes would be levied on the profitability of the enterprise rather than royalties. Higher state mining royalties, lower commodity prices and higher costs will put the squeeze on the mining companies. It will be quite delicious to see them then urging a tax based on profits/losses rather than royalties.